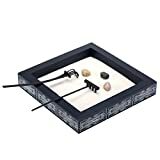 Square wooden zen garden kit with intricate white and black design box tray. Set includes white sand, 2 plastic rakes, 3 rocks and a black wood box to create zen and tranquility. Perfect for relaxing or de-stressing at home, the office, business or yoga studio. Approximate Dimensions (in inches): 1.25 H X 7.25 W X 7.25 D.
Create a space of relaxation and tranquility with this zen garden kit. The kit features a wooden black box with intricate white heart tribal design for holding all your relaxing equipment. White sand lays gracefully in the bottom of the tray for you to cultivate. Three decorative rocks can be placed randomly or with purpose on the sand. Two garden rakes let you create designs in the garden’s sand. Four pads have been adorned to the bottom of the box to prevent the garden from sliding or scratching on surfaces. So add balance and feng shui to your home, office, yoga studio, business or meditation space with this decorative zen garden set.